In July 2014, Geneva Call gathered in Goma influential people who are aware of the dynamics of armed non-State actors (ANSAs) and could potentially support Geneva Call in its effort to protect civilians in the conflict in North Kivu. A group of elderly community representatives from Goma, called the Baraza, selected provincial Members of Parliament, community-based and civil society organizations were engaged in dialogue and sensitized to international humanitarian norms, in particular the protection of children and the prohibition of sexual violence in armed conflict. The meeting aimed at making an inventory of local capacities to address protection issues. The strategy of intervention of Geneva Call in the Democratic Republic of Congo (DRC) was also discussed. The Congolese stakeholders offered to support Geneva Call’s engagement and dialogue with ANSAs on the protection of civilians. Though themselves victims of the conflict, communities also maintain complex family and ethnic relationships with many of the ANSAs and they could be entry points for Geneva Call to reach combatants and encourage them to abide by international humanitarian norms. From now on, Geneva Call will be piloting its activities from its newly-established office in Goma. It is hoped that this permanent presence will make a difference and be able to sustain the dialogue with actors who have a responsibility to protect civilians. About 40 armed groups and militias are active in Eastern DRC. 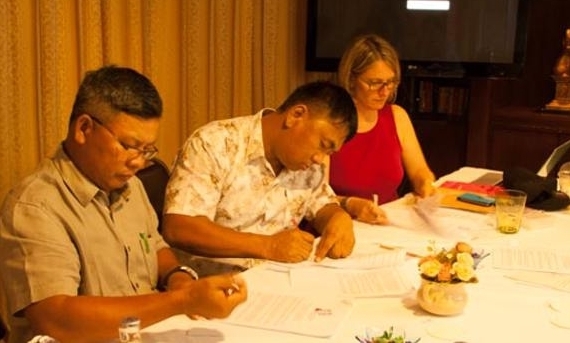 On 10 July 2014, the “Government of the Peoples’ Republic of Nagaland”/National Socialist Council of Nagaland (GPRN/NSCN)-Khole-Kitovi signed Geneva Call’s three Deeds of Commitment on protecting children in armed conflict, banning anti-personnel mines, and prohibiting sexual violence and against gender discrimination. The GPRN/NSCN, which is in a ceasefire with the central Government, is fighting for the self-determination of the Naga people. Through these signatures, the GPRN/NSCN publicly confirms its commitment to protect civilians from the effects of armed conflict. In particular, the GPRN/NSCN pledges not to allow children under 18 to be recruited or used in hostilities and to ensure everything is done to provide children access to education and other services. In a region where cases of sexual violence have been reported, the GPRN/NSCN also reaffirms its determination to strictly prohibit any form of sexual violence and to work towards eliminating gender discrimination. Lastly, the GPRN/NSCN also commits not to use anti-personnel mines or victim-activated explosive devices. Geneva Call has now moved to new offices. Please note our new address: 47 chemin de la Chevillarde, CH-1224 Chêne-Bougeries. 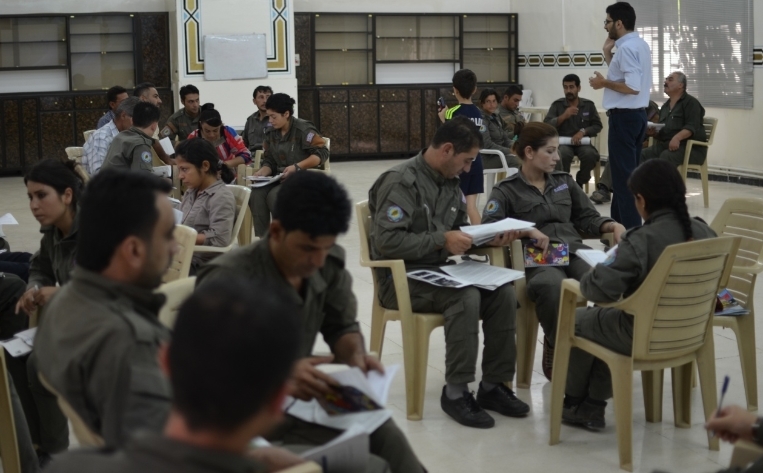 Another two-day session was organized in July in Rmeylan for the Asayish - the police forces of the Self Administration - and gathered 28 officers. It was the first time Geneva Call could sensitize the Asayish on international standards governing security and law enforcement operations.